BIAS's cross-platform plug-in bundle offers some new thinking on dynamics, EQ and pitch correction. The BIAS Master Perfection Suite of plug–ins, which also comes as part of the BIAS Peak Pro XT package, comprises key mastering tools such as multi–band compression with limiting and parametric EQ, but there are other tools that can be used both for tracking and mastering. These include a very flexible expander/gate, a pitch–correction system that can also be used to make voices and other sounds deliberately weird, and a fingerprint EQ system that can be used to match the spectrum of one piece of audio to that of another. The icing on the cake is an incredibly comprehensive metering system that shows the history of a piece of audio in both the time and frequency domains. The Master Perfection Suite is a boxed product, but all the component plug–ins are also available separately from the BIAS web site. They are compatible with Audio Units on the Mac and RTAS/Audiosuite and VST on both Mac and PC, and can get by on a Mac G4 or an Intel Pentium III, but a 2GHz or faster processor is recommended. Supported operating systems are listed as Windows XP Home/Professional with Service Pack 2 or Windows Vista for PCs, and Mac OS 10.4 or later on Apple machines. Installation requires 300MB of available hard disk space and authorisation is via the BIAS web site, using the serial number from the software package. GateEx, as its name suggests, is an expander/gate, and includes high–resolution input and output meters, a waveform display of the input relative to the current threshold setting, and a graphical view of the gate threshold and 'hysteresis' settings. The latter is useful, as it effectively allows the threshold at which the gate closes to be offset to be a few dBs lower than the threshold at which it opens. This can be useful in stopping gate 'chatter' — rapid repeated opening and closing that can occur when the decay envelope of a sound isn't as smooth as it might be. As well as adjustable hysteresis and look–ahead, GateEx has the expected attack, release, hold and depth controls, and in expander mode the ratio may also be set by the user. As with the other plug–ins included here, up to four snapshots can be saved and called up for instant comparison, and parameter values may be adjusted with the on–screen controls or typed directly into parameter boxes. You can save or load settings at any time in the usual way. The gate works fine and the waveform display really helps to show you what is above and below the threshold. However, there's no side–chain filter, so you can't make the gating frequency–sensitive. 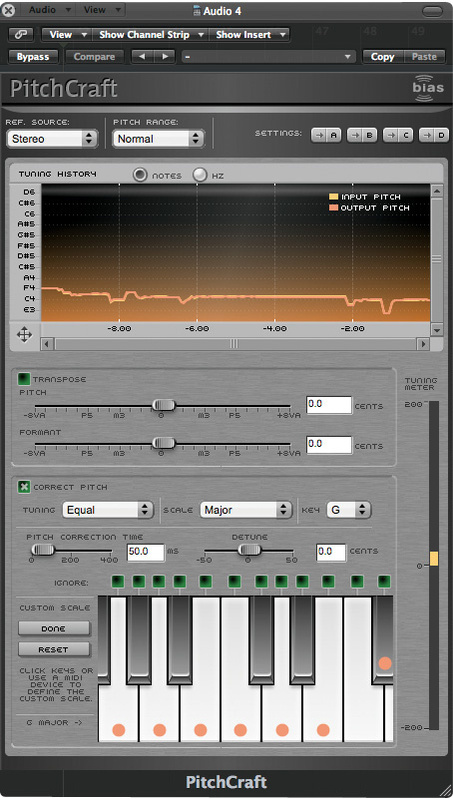 PitchCraft can be used for basic pitch correction or more creative mangling.Like several other pitch–fixing plug–ins, PitchCraft adopts the paradigm first developed by Antares with their ground–breaking Auto–Tune plug–in, displaying the musical scale as a one–octave section of piano keyboard. Pitch–detection and shifting algorithms are then used to nudge errant notes towards the nearest 'legal' note in the scale defined on this keyboard. The pitch range over which correction is applied can be set by the user, and shifted notes can have their formants preserved automatically, to avoid unnatural changes in character. Of course, if you want unnatural, you can opt to modify the formants or pitch (plus or minus one octave) to morph voices from demonic at one extreme to cartoon mice at the other. You can also adjust the pitch–correction speed to provide slow, natural corrections or fast, vocoder–like note changes that strip away all vibrato and feeling. Where the host program allows MIDI data to be sent to a processing plug–in, new notes can be added to the user scale in real time to control more musically complex passages. As with all such plug–ins, a fairly clean monophonic input is required. The keyboard displays the current scale, while a history window shows the originally performed pitches and the scale–corrected pitches in a graphical form, so you can see how much work the software is doing and on which notes the biggest problems occur. There's also the familiar tuning meter (vertical this time), which shows in real time how much pitch correction is being applied. However, you don't get the keys lighting up to show you the notes being detected, which I find useful on other plug–ins. In practice, the pitch–fixing works at least as well as Logic's Pitch Correction, and as long as the original vocal isn't too far out and you pick the right scale notes, it sounds pretty natural. The formant control only sounds natural over a very short range before moving into special–effects territory, and much the same can be said of the pitch–transpose function. 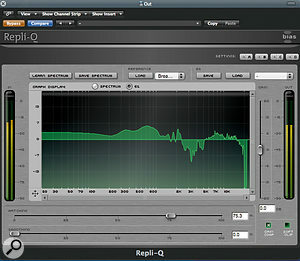 Repli-Q allows you to impose the frequency profile of one track on another. 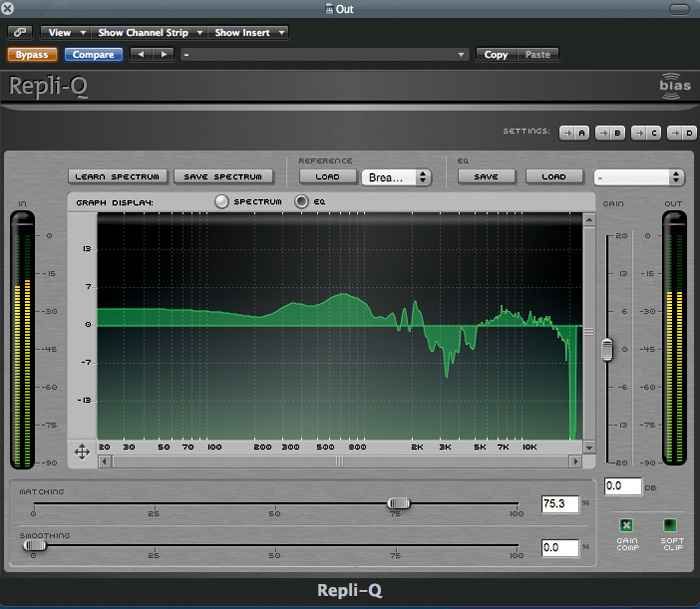 Repli–Q is a 'fingerprint' EQ and works in a very straightforward way, though you can get your hands dirty and tweak the EQ curves it comes up with if you want to. In essence, it can 'learn' the average audio spectrum from one audio file, save it, then use the information to EQ a second audio file to make its spectrum match that of the first reference file. Repli–Q works over a huge number of frequency bands and so comes up with a very detailed correction curve. This type of plug–in can be useful for making your mixes sound more like those of your favourite producers, but only if the music is broadly similar. For example, any attempt to make a solo flute track sound like a drum and bass mix will simply try to boost frequencies that were never present in the audio being processed, and will invariably sound dreadful. A slider allows the user to vary the amount of spectral correction applied (using less than 100 percent often sounds best), and there's also a smoothing fader to round out some of the finer peaks and holes in the resulting EQ curve that might otherwise create audible 'peaky' resonances. The spectrum display shows the spectra of the two pieces of audio plus the spectrum of the second piece of audio after equalisation, each of the three spectrum lines being colour–coded. There's also an EQ view mode that shows the correction curve; this can be edited by dragging with the mouse to cut or boost sections in a parametric EQ kind of way, with the width, amplitude and Q of the edits definable by the user. Automatic gain compression and soft clipping is available to take care of any high peaks caused by the EQ. In practice, Repli–Q works very much like other fingerprint EQ plug–ins I've tried, and produces similar results, which can vary from the spectacularly useful to the disappointing, depending on what you expect it to achieve. If you're doing a cover version of an existing song, for instance, you can get your mix to sound more like the original, though often 75 percent correction is enough in this application. When matching mixes, it can help if the songs are in the same key, as the fine 'spiky' EQ curve detail often tends to relate to the musical key. Yet another use is to more closely match the sound of mixes done at different times or in different locations so they sit together more comfortably on an album. It can also be used to make DI'd acoustic guitars sound more like miked–up samples of the same instrument, which is a neat way to achieve a nearly miked sound, but with the benefit of the separation that's only possible from DI'ing. Reveal is a comprehensive metering plug-in.Reveal provides a set of meters in a similar format to the respected Spectrafoo plug–in beloved of Pro Tools users. Its various windows offer Peak/RMS level meters, a Lissajous 'jellyfish' phase meter for evaluating the stereo components of a mix, a waveform oscilloscope, a Pan Power meter that looks at the level of non–centred sounds, and a Phase Correlation meter. The plug–in also hosts a Peak/RMS power history, a high–resolution spectrum analyser, and a spectrogram that maps out the energy in different parts of the frequency spectrum. The Level Meter range is user–adjustable, and a global Freeze button stops all the displays for analysis. Tabs beneath the multi–meter display allow any individual meter to be viewed full size. The high–resolution meters and spectrum analyser are practical tools with intuitive results, as is the phase meter, which can tell you a lot about stereo width and symmetry, but some of the other meters need more knowledge to interpret. It is worth persevering, though, as the meters can tell you a lot about both your own mixes and commercial mixes, which may help you refine your mixing technique. Already the high–resolution meters have solved a problem for me, because they showed a background noise level of –75dB when my sequencer wasn't running. This was traced to the live sequencer channel input from my faithful old Roland JV2080 adding its own output–stage noise to the proceedings. Muting its channel until needed cured the problem. 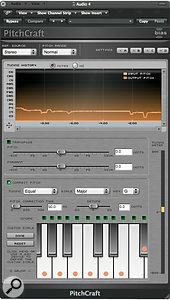 SuperFreq is a parametric EQ that comes in four–, six–, eight– and 10–band versions. There's a familiar curve display, draggable curve points and separate adjustment of gain, frequency and Q for each band, with the ability to set up Peaking, High Shelf, Low Shelf, High Cut and Low Cut Filter types, each with a cut/boost range of ±24dB. Bandwidth (Q) can be set from 0.1 to 30, and each frequency band can be tuned over the range 20Hz to 20kHz. Individual bands can be bypassed, and there are high–resolution level meters to go with the global controls and compare buttons found on all these plug–ins. Conceptually this is a very conventional EQ plug–in, but I have to say that it sounds surprisingly analogue–like: the results are somehow musically satisfying, and usually require very little cut or boost to achieve. A little low–end boost brings up the bass end of a mix without turning things to mud, while at the other end of the spectrum, a dB or two of air EQ at 10kHz or above really hits the spot, without making the mix seem gritty or aggressive. 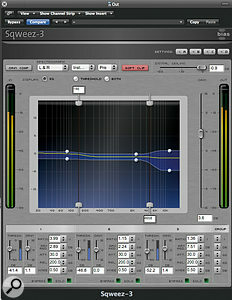 The Squeez multi-band compressor offers some unusual features, such as the ability to restrict the amount of gain reduction in each band.Sqweez–3 and Sqweez–5 are three– and five–band versions of the same multi–band compressor, and both provide automatic gain compensation, switchable soft–clipping and a user–settable limiter ceiling. Sqweez has an integrated spectrograph display, and each band can be soloed, allowing you to hear the effect of your compressor settings in each area of the frequency spectrum. There's a global gain control plus adjustable band levels, and each band has controls for Threshold, Ratio, Maximum Gain Reduction, Attack, Release and Knee shape. The ability to set the maximum amount of gain reduction applied regardless of input level makes this compressor very powerful. In effect, it means that you can apply compression to mid–level signals without overly changing the dynamics of very loud or very quiet sounds. It is also possible to select negative compression ratios, to turn the bands into expanders where necessary for increasing dynamic range. 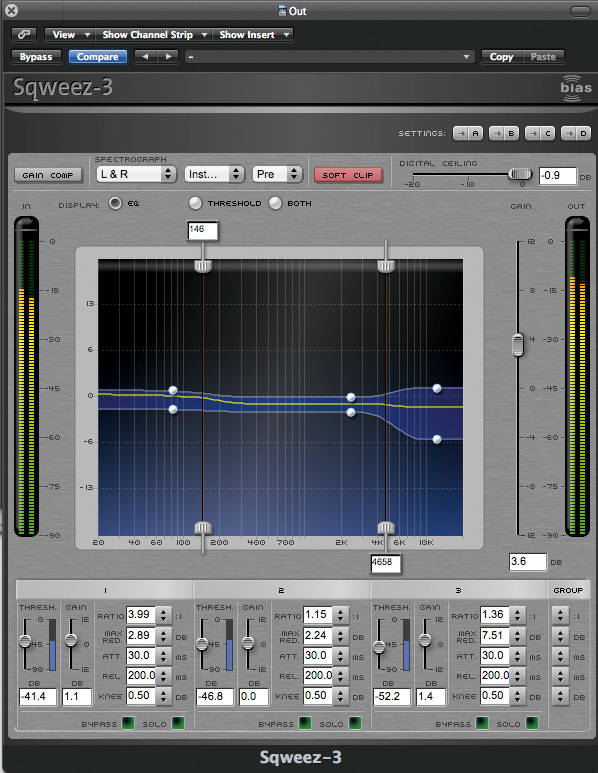 I enjoyed using Sqweez, as it is straightforward and has an informative interface that shows in a very intuitive way how the gain changes. The graphic display has draggable crossover points, so you can decide where best to split the audio spectrum if you don't like the defaults. The ability to limit the amount of gain reduction taking place in any band is hugely useful, and I got some great–sounding results out of it in just a few minutes. For mastering, low ratios and low thresholds are the order of the day, and some very low values need to be typed in, as they fall between the steps you get if you use the on–screen controls, which is no problem. Higher ratios can be useful on individual tracks: a particularly useful application of multi–band compression, for example, is to even up the level and tone of a vocal where the singer hasn't been too careful about maintaining a sensibly constant distance from a cardioid-pattern microphone, and the changing distance also alters the amount of bass lift. In all, the Master Perfection Suite is a nice bundle, with the stars for me being the SuperFreq EQ, the Sqweez multi–band compressor and the elaborate Reveal metering. SuperFreq, in particular, sounds very 'analogue' and smooth, which can't be said of all plug–in parametric equalisers. The pitch and fingerprint EQ plug–ins work more or less as well as the ones in Logic 8, and users of other DAWs that don't include such tools should find them very useful. While the expander/gate is very smooth and predictable, with a better–than–usual display, the lack of side–chain filtering could be a limitation for some users. This particular plug–in bundle covers a lot of ground, and given that not everyone will find all the components equally useful, it's sensible of BIAS to make them available individually. The bundle price is very reasonable given the undeniable quality of the individual plug–ins, but if you already have some equivalent plug–ins that you're happy with, it's nice just to be able to buy the tools you need. Overall, the Master Perfection suite lives up to the very high standards that BIAS have set themselves in other software areas. No side-chain filter on gate. 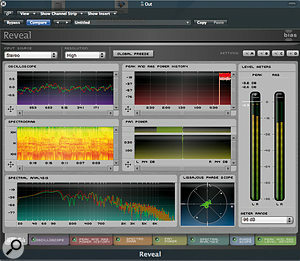 A great plug-in tool kit well suited to, but not limited to, mastering and mix polishing applications. Master Perfection Suite (boxed) £419.01 including VAT. GateEx $59; SuperFreq $79; all other individual plug-in downloads $149. SCV London +44 (0)20 8418 0778.